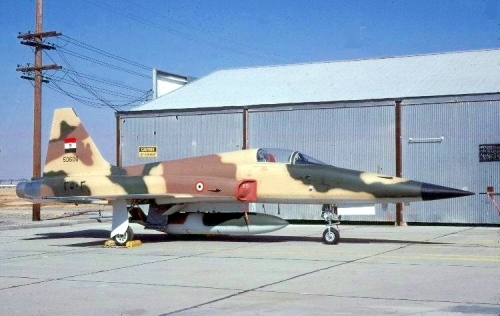 Initial interest for the Northrop F-5E was shown when Egyptian President Anwar el Sadat visited Washington on 06-04-1977 requesting the delivery of 20-24 Northrop F-5E without success, request that was renewed beginning of 1977, this time for 30-40 aircrafts. The request was looked in a more favourable light beginning of 1978, when the US Senate voted in favour of "Middle East Fighter Package", to counterbalance the delivery of McDonnell Douglas F-15s both to Israel and Saudi Arabia. Egyptian government obtained a letter of offer covering 42 F-5E and 8 F-5F at a total cost of USD 400m, Saudi Arabia financing the deal. Negotiations were expected to be ended by July 1978 in order that delivery of first 8 aircrafts, former Ethiopia destined, could be effected within 2 months. Criticism came from Israel, that protested. Egypt was satisfied for the delivery of combat aircrafts but felt quantity to be insufficient. First 8 F-5Es were available for delivery at McClellan AFB on 02-11-1978, while training of 16 pilots and 40 ground crews started beginning of 1979. Unfortunately the Tigers were withhold, as payment from Saudi Arabia was not forthcoming. Price was claimed to be too high relatively to the cost of Saudi aircrafts, financial situation aggravated by a site survey in Egypt revealing that the estimated costs of introducing the new fighter were actually around USD 700 million. Signature of Egyptian/Israeli peace treaty on 26-03-1979 gave the death blow to the deal; Saudi Arabia cancelled the order placed on behalf of Egypt and the initial 8 aircrafts were diverted to the Yemen Arab Republic by US State Department.